The Genie® S®-125 boom lift is now replaced by the new Genie® Xtra Capacity™ SX®-125 XC™ boom lift , perfect for heavy lifting in construction, bridge inspections and maintenance, stadium and sports arena, oil and gas, industrial, telecommunications and utility applications. 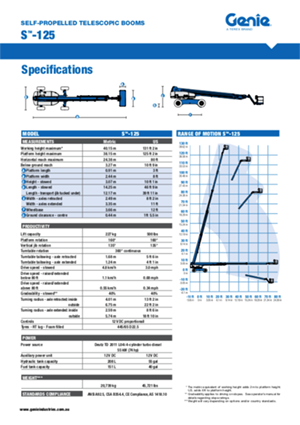 The Genie SX-125 XC telescopic boom works in more applications that require higher capacities thanks to its industry-leading dual lift capacity — 300 kg (660-lb)/454 kg(1,000-lb)*. * Maximum outreach zone / maximum capacity zone.